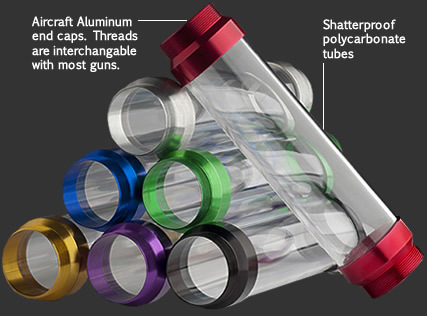 Manufactured from shatterproof polycarbonate with blue anodized aircraft aluminum end caps. Standard thread design on end caps are interchangeable with most grease guns. Made in The USA. Clear grease gun tubes eliminate grease cross-contamination by allowing the operator to identify the type of grease being used. Color coded end caps can also be used to identify grease type, frequency of use, or application point. Available in 7 colors.